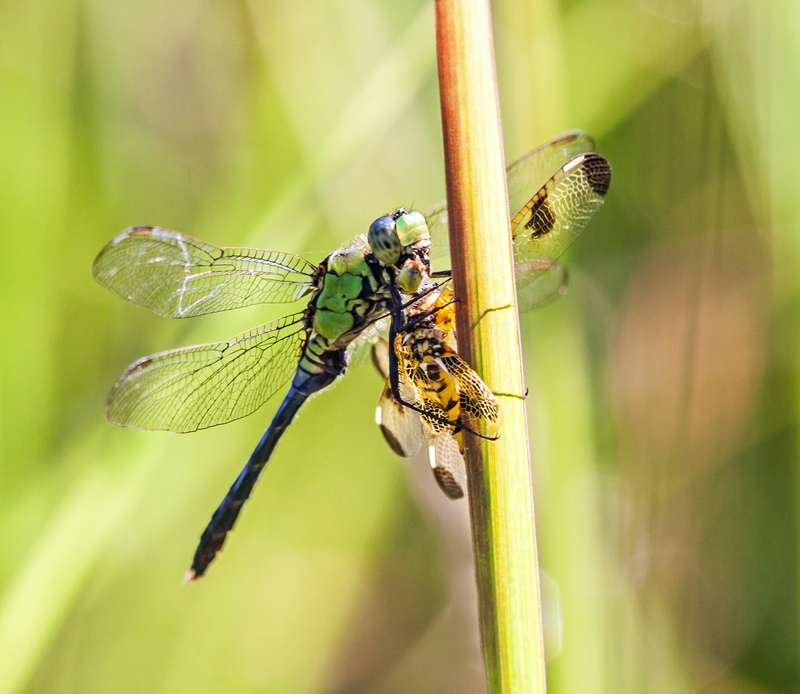 I was simultaneously fascinated and horrified yesterday at Occoquan Bay National Wildlife Refuge as I watched this Eastern Pondhawk dragonfly (Erythemis simplicicollis) gnaw on the head of a colorful Calico Pennant dragonfly (Celithemis elisa) that it had captured. I know that dragonflies eat other insects, but in my mind I tend to think of them consuming mosquitoes and other such smaller insects. Some of them, however, apparently prefer larger prey, including other dragonflies. Benjamin was a bit surprised and a tad dismayed when I read that the one dragonfly was eating the other one. He felt that they should only eat other bugs, not each other. After looking at the enlarged photo for awhile he said : “That is a carnivore dragonfly, just like a T-Rex dinosaur! He must be very hungry!” Thank-you, Mr. Mike!! Eastern Pondhawks are not the largest dragonflies that I have seen, but they seem to be one of the fiercest in terms of preying on other dragonflies. I like the analogy with the T-rex. Survival of the fittest. And yes, must agree with Ellen – he must have been very hungry! Eastern Pondhawks seem to have voracious appetites indeed. Eewww…. one of those grim things you can’t take your eyes off! Great capture though. Interesting capture Mike! I have seen it happen quite a few times before. The first time I was surprised they did that! Usually they seem to be larger than their prey.